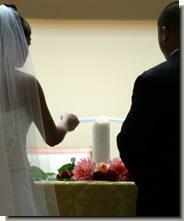 The lighting of the Unity Candle has long been a tradition of today's weddings. As the bride and groom together light the larger Unity candle with their individual lighted candles, the single flame that results symbolizes the joining of their individual lives into one. Often brides and grooms then extinguish their individual candles, signifying that their individual selves no longer exist, that they are now and forever part of a couple. 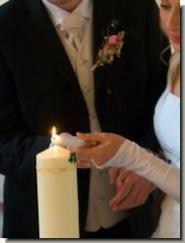 I like to suggest to couples that they consider allowing their individual candles to remain lighted. It is my belief that the gifts we each bring as individuals are what make a marriage strong, and that we don't give up our individual selves when we get married. This is my own belief, however. Each couple must make that decision for themselves, and I will honor whatever they decide. The Blending of Sands has become a popular alternative to the Unity Candle ritual. 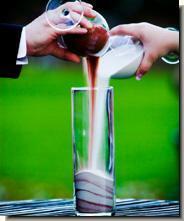 It is an excellent choice for outdoor weddings where keeping candles lit can be a challenge. It also eliminates any safety issues presented by lighted candles. In this tradition, the bride and groom each choose a colored sand to represent themselves; each is held in its own individual container. Together they pour the sands into a single, larger container. As the two different colors of sand are combined, they not only form a unique and beautiful pattern, but it becomes clear that once joined, they can never be separated. Couples can vary this ritual to include additional sand colors to represent the children of a new blended family, or the joining of two extended families. There are a number of variations of this ritual, but they all symbolize the binding of two hearts and two lives into one. During the ritual, the couple is asked to join hands, and the officiant uses a cord or ribbon to tie their hands together. The resulting knot represents the binding nature of the vows that are exchanged. This ritual is also the basis for the expression "tying the knot" when referring to getting married. Jumping the Broom is a ritual in which the bride and groom, either at the ceremony or at the reception, signify their entrance into a new life and their creation of a new family by symbolically "sweeping away" their former single lives, former problems and concerns, and jumping over the broom to enter upon a new adventure as husband and wife. This ceremony, derived from Africa, dates back to the 1600s and is often linked to the days when slaves were not allowed to marry. It also has roots in the Celtic culture (including but not limited to Welsh, Celtics, Druids, and Gypsies) and some aboriginal or shamanistic cultures. 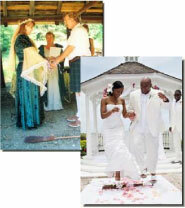 Jumping the broom together has become part of today's weddings for couples who want to honor these early traditions. Many couples have friends or family members who are unable to be present at their wedding. Some may live too far away. Others may be too ill to attend. Or they may have passed away. The Remembrance or Memorial Candle is a lovely way to acknowledge these special people and have them "present" at this very important occasion. The Remembrance or Memorial Candle is usually lit by either one or both parties of the couple (depending upon who is being represented by the candle) at the beginning of the ceremony, after the processional and officiant's call to the celebration, while the officiant explains who is being honored. One alternative would be to place a bouquet of flowers in a place of honor on the altar or near where the couple and officiant are standing. A second alternative would be to place the candle or bouquet where the honored person would have been seated if he or she had come. At one wedding, the bride placed a bouquet where her recently deceased best friend would have been standing as her bridesmaid. Many brides and grooms come from cultures where other special ceremonies and rituals are observed. These can be a lovely addition to any wedding. Native Americans include a special drum ceremony in their tribal weddings. The Wiccans invoke the Four Elements. There are as many unique wedding rituals as there are cultures! I am happy to discuss with you how to weave your own cultural traditions into your ceremony so that it is meaningful to you and your guests. But please, no animal sacrifices!